Christmas is a time for family gatherings, indulgence in great dinners and a time to be count your blessings and be thankful for them. And I'm certainly counting mine thanks to the festive plethora of choices from Momiji and Medz! We begin with more traditional tastes with one of my favourite dining spots; Medz. 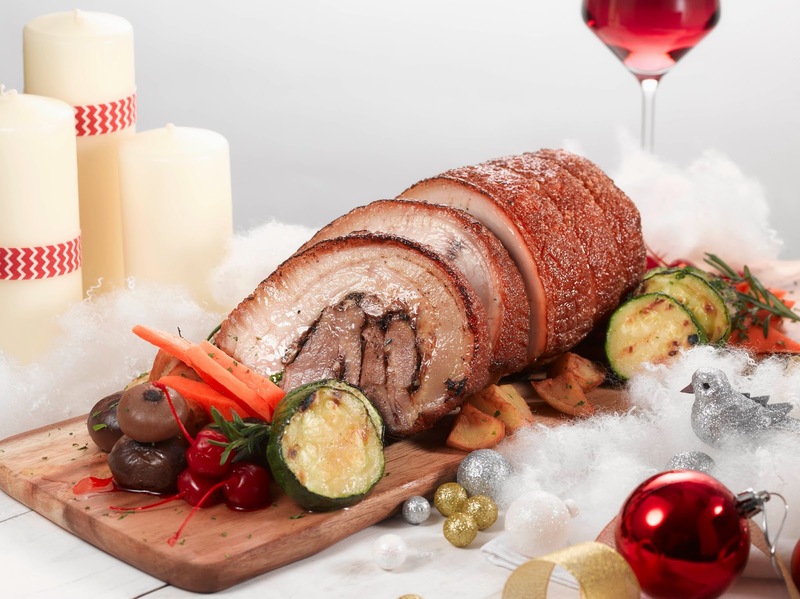 Oven Roasted Pork Roulade with Provencal Herbs and Confit Garlic $68 (1.2kg) is a magnificent roll of the pork belly filled with bacons and Medzs’ recipe nuts at the heart of the layers of meats. It is nicely balanced with roasted root vegetables and gravy. 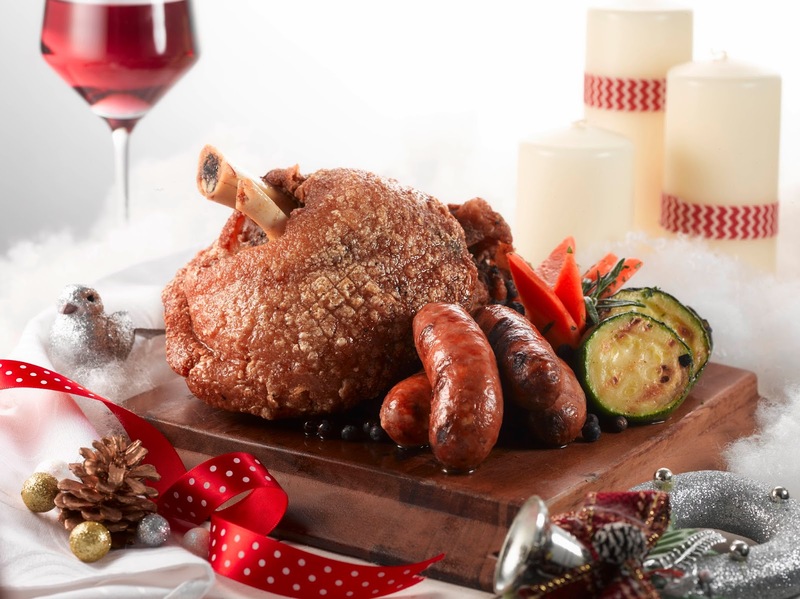 Being a true carnivore, its no wonder why this Oven Roasted Crispy Pork Knuckle with Bratwurst $68 (1.5kg) is my pick of the day. I enjoyed the tender meat portions which under the roasted crispy skin, which was not too dry thanks to its tastful salty gourmet marinade. Served with roasted root vegetables and home-made natural gravy. 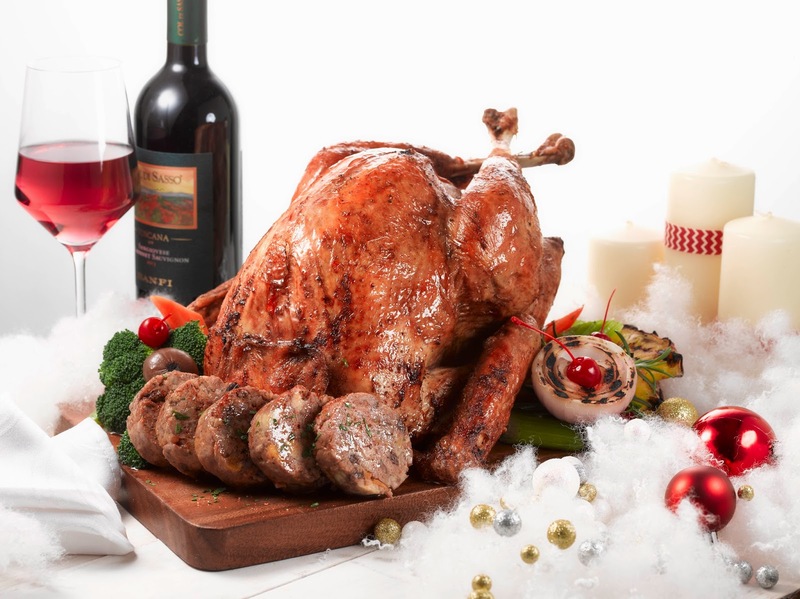 The true Christmas traditionalist will not be disappointed with the Mediterranean Spice Infused Whole Turkey with Foie Gras and Chestnut Stuffing $118 (4kg). Roasted nicely to golden brown, its meat remains moist and succulent, together with roasted root vegetables that is drizzled with home-made natural gravy and cranberry sauce. I never thought I'd like sweet and savory together but the combo works. I am still not a fan of foie gras but its pretty well cooked with a firm consistency. FYI, you can pair your savory dishes with wines such as Hardy’s Mill, Robert Mondavi, Jacquart Reims and Castello Banfi. 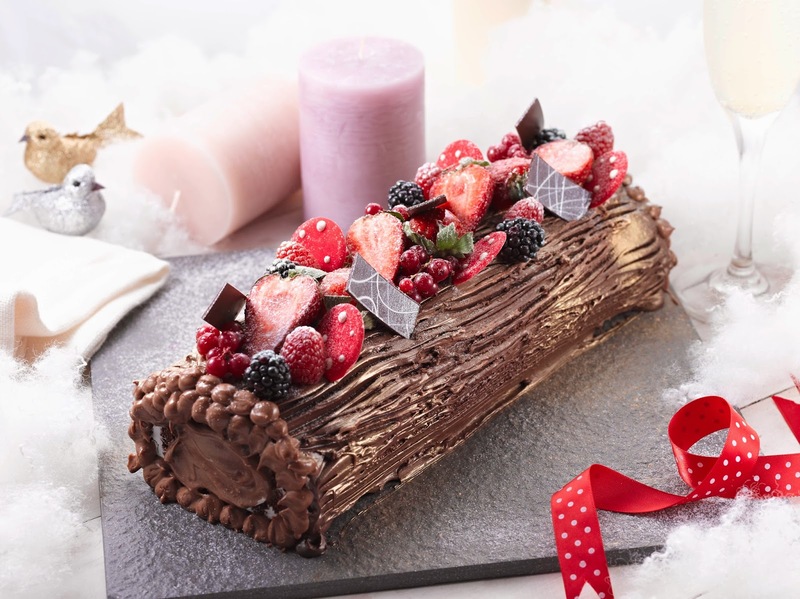 Belgian Dark Callebaut Log Cake ($43.90, 1.2kg) is sinful with 100% Belgian dark Callebaut chocolate which is encrusted with crispy chocolate pearls between layers of chocolate sponge and truffle cream. It's indulgence at its best, being a balance of fluffy cake with sweet-bitterness. Plus, I think it looks very much like a mini log, unlike some that I see sold at commercial bakeries where it barely resembles it. 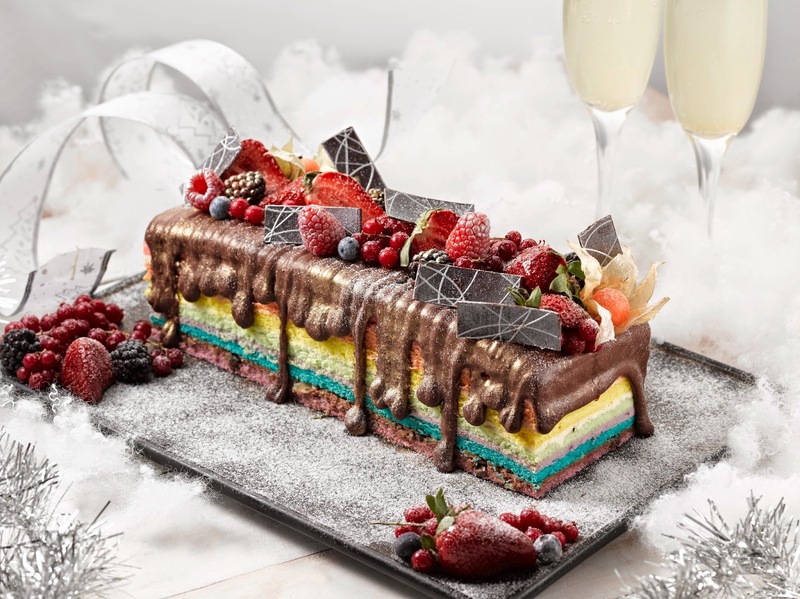 How can we forget their bestselling MEDZS Rainbow Log Cake ($46.90, 1.2 kg), which was voted by 8 DAYS magazine as the best of its kind. Featuring 7 layers of flavoured cream: cream cheese; orange cream; caramel;blueberry; peppermint; chocolate chips; and almond, each slice is dripped generously with a chocolate ganache with berry fruitiness. The fluffiness of the cake was in proportion to its sweet toppings, and trust me when I say it looks as good as it looks. Having that house party? 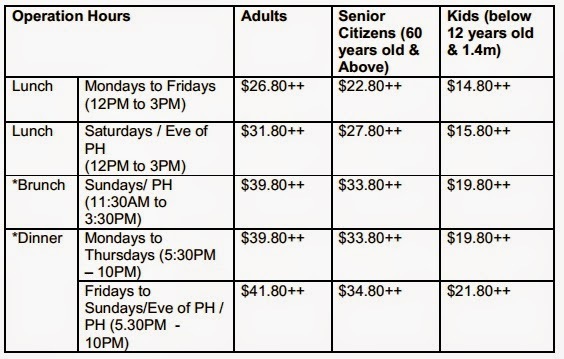 You can simply place an order or make an enquiry at any of the three MEDZS outlets, although do note a $30 deliverycharge of $30 will apply. 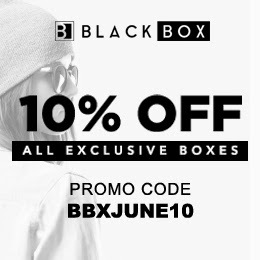 Alternatively, orders can be collected at the customer’s preferred outlet. 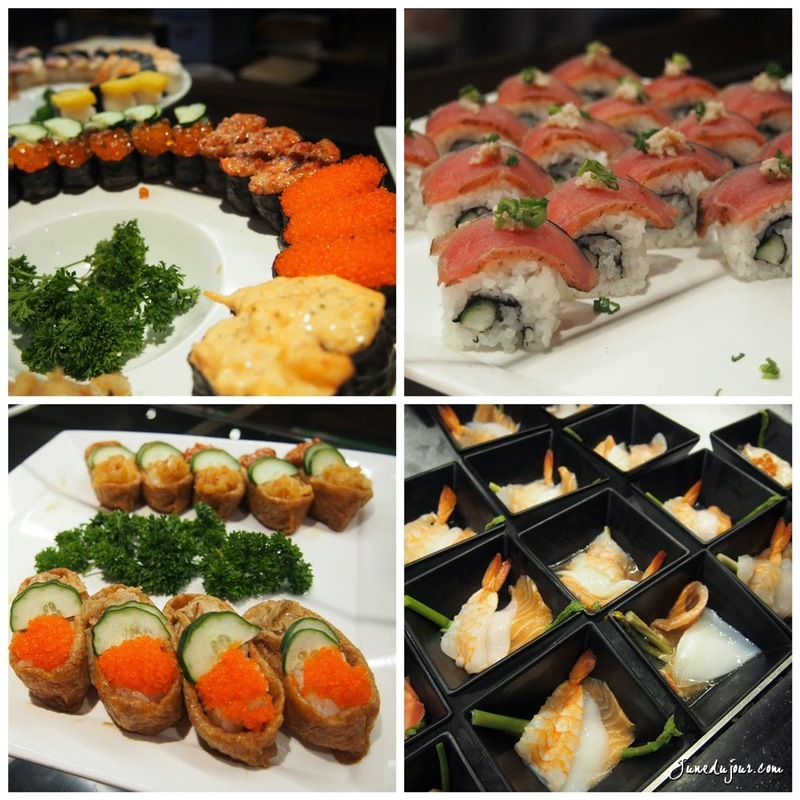 But if you are looking for something abit different, why not go for some Japanese tastes at Momiji? My first time here certainly did not disappoint: with its open-concept marketplace layout, Momiji boasts relatively affordable prices but offering a huge arrays of choices such as sushi, sashimi, teppanyaki, tempura, shabu-shabu, fry-to-order, yakitori, cooked food and a well-stocked dessert. Do not miss: Haagen Dazs ice cream and free flow Sapporo beer (6:30-7:30pm daily, and 12:30pm-1:30pm for brunch buffet). Lovers of oysters, you seriously lucked out. 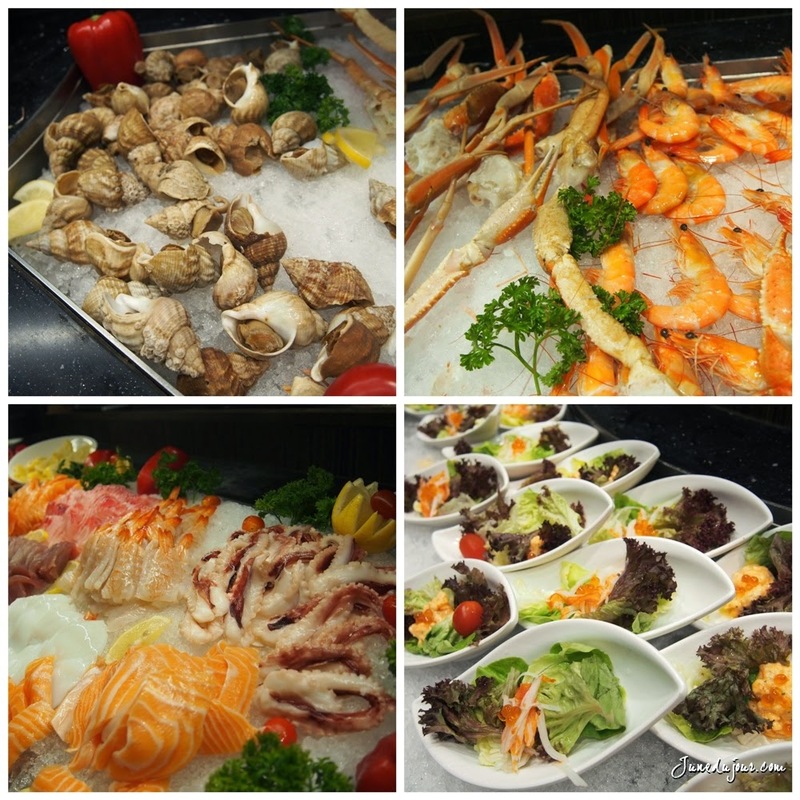 Be treated to a series of oyster dishes prepared in 8 different ways such as frying, steaming and cooking in Shabu Shabu. (Note: Only 5 kinds of oysters will be served during lunch). You will be tested on how well you know your shellfish: just how many can you recognize? Expect Goma and Ponzu Oyster, the sweet tangy Japanese Apple Dressing Oyster, Panko Fried Oyster and Oyster Lobster Mayo Yaki. In a soupy mood? 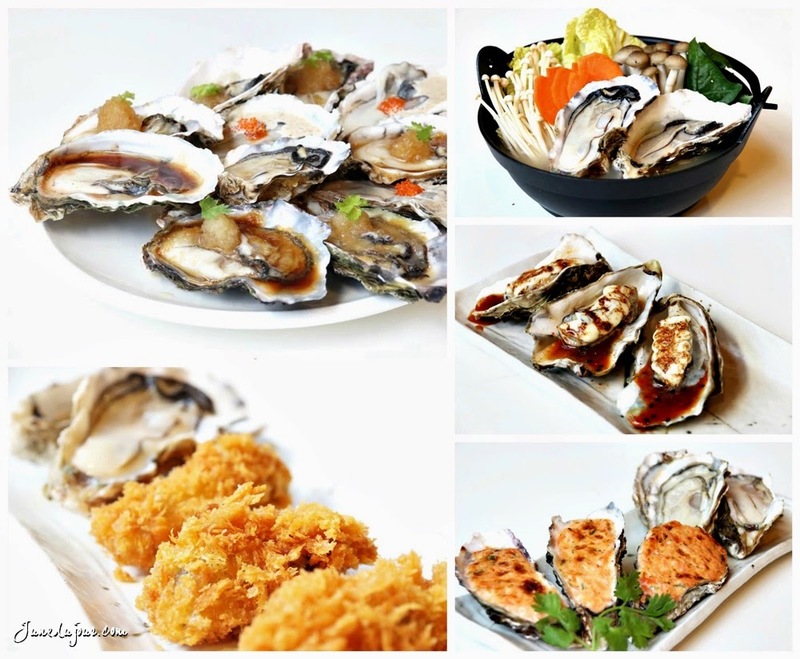 then go for the Miso Teppan Oyster or Oyster Shabu Shabu! Just look how happy my mom, the die-hard oyster fan looks! 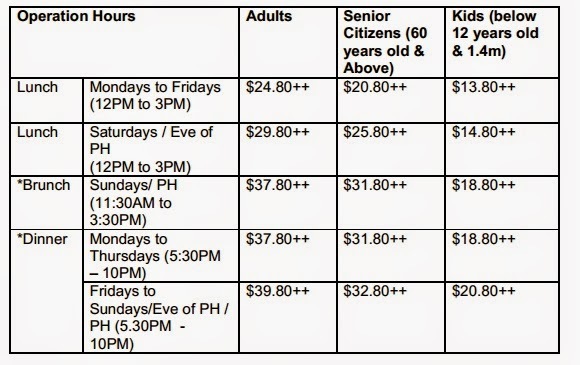 Apart from the massive array of culinary choices, Momiji is not complete with out the season's Christmas dishes featuring items such as Honey Glazed Turkey Ham with Mushroom Sauce, Turkey Breast Teppan Yaki, Turkey Ham Tempura with Nacho Cheese, Baked Salmon Lasagna and Christmas Log Cake. But, fastest fingers first! 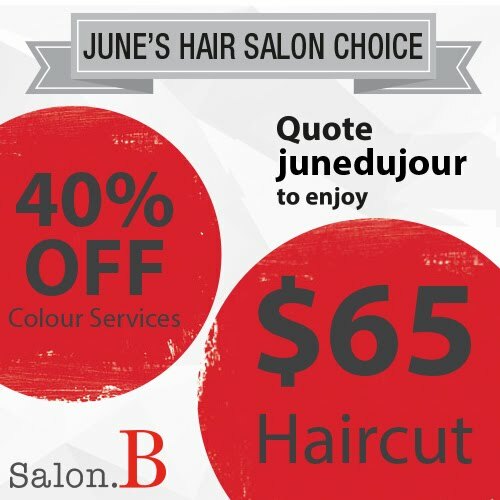 Promotion is only available from 19 December 2014 till 1 January 2015. 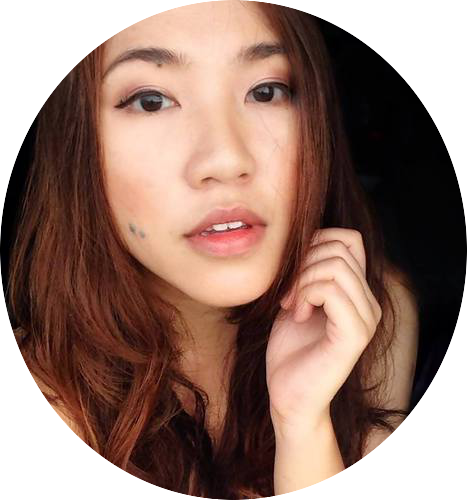 PS: I do apologize in advance for the press image use as my camera is currently wonky for the time being. But trust me, they look (and taste) as good as they're pictured!